Lowest prices all the time, guaranteed! If you find a better price, let us know. Whitney Quilt bedding by C & F Enterprises brings blue skies and lovely garden flowers into your home. The quilt has a light blue background scattered with pink roses. Softly scalloped edges have self binding trim. Quilt reverses to a tan stripe. Whitney Blue comes in a set with the quilt and shams. The shams have the same floral print as the quilt and also feature scalloped edges. Add your choice of accessories to style your room. A white seersucker sham and bedskirt set the scene for the quilt. Add a throw pillow in solid white or a white pillow embroidered in blue diamond shapes. Highlight your window with a valance in the floral print from the quilt. Bedding is a cotton/polyester blend and machine washable. Pillow is spot clean only. The Whitney Blue Full Queen 3 Piece Quilt Set has a soft blue background scattered with pink roses. Scalloped edges with self binding trim. Quilt reverses to a tan stripe. Set includes one full queen quilt, 90"W x 92"L and two standard shams 20" x 26". Fits full and queen size mattresses. Cotton blend. We offer the complete ensemble in the Whitney Blue pattern by C & F. Manufacturer's UPC code is 008246510550. 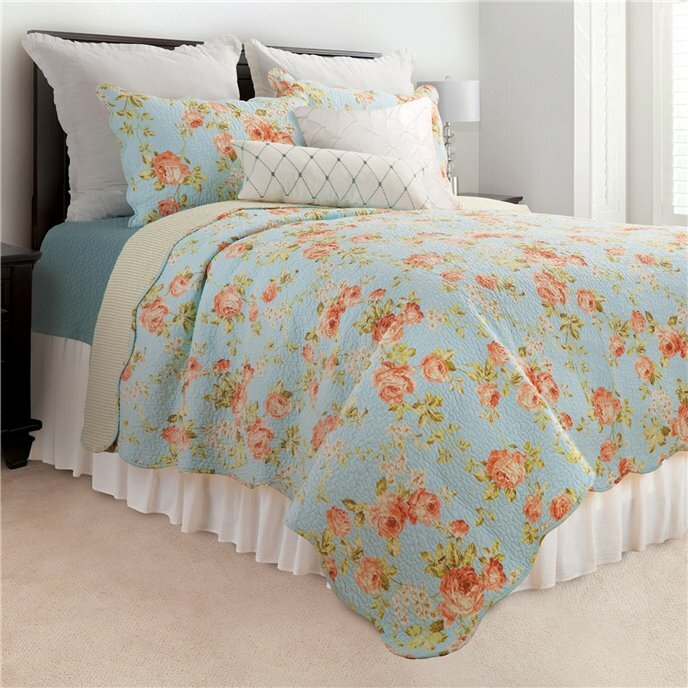 The Whitney Blue King 3 Piece Quilt Set has a soft blue background scattered with pink roses. Scalloped edges with self binding trim. Quilt reverses to a tan stripe. Set includes one full queen quilt, 108"W x 92"L and two king shams 20" x 36". Cotton blend. We offer the complete ensemble in the Whitney Blue pattern by C & F. Manufacturer's UPC code is 008246510567. White seersucker euro sham with pleated ruffle edge. 26" x 26". Gathered white seersucker bedskirt. 60" x 80", split corner, 18" drop. By C & F Enterprises. Barbados Sea Aqua Diamond Pillow has a stitched diamond design in blue on an off white pillow. 12" x 24". Williamsburg design. We offer the complete ensemble in the Barbados Sea pattern. Manufacturer's UPC code 008246492658.